Right now in America, we are experiencing what could be termed a soft partition on facts. Depending on which side of the political spectrum you follow, you have your own set of "facts" that are utterly different from the "facts" that the other side holds inviolable. If you are on the left, you believe that all Republicans want to reduce America to a two class society where wealth equals power, and if you are part of a minority or a woman, they want to take away all of your rights and put you in chains. You also believe that the Social Safety Net is an essential part of American Exceptionalism; that wealth inequality is going to doom economic growth; and that the United States must lead by example and be an integral part of the community of nations. Finally, even if you don't think Obamacare goes far enough toward equitable health care, it is at least a good start that can be built on to. If you are on the right, you believe we have a coke dealing, illegal alien, Muslim President who wishes to turn America into a socialist country under the control of the United Nations. You also believe that people who receive Entitlements are lazy "Takers" who contribute nothing to the economy or country; that tax cuts for the rich are the best way to spur economic growth; and that the United States is a Force Majure in the world, and we do not ask for agreement, we demand it. Finally, you think Obamacare will destroy the country, and you might even question whether all people have a right to have health care at all. In actual fact, the only thing that either side can agree on is that their opponents will destroy the country they love. Beyond that, there is almost no agreement. Anything one side believes is completely discounted by the other side as lies and falsehoods. It is a terrifying scenario. However, in this blog, I am not going to look at the actual answers of who is right and who is wrong. I am not out to deconstruct arguments, fact check or prove a point. Really, in this case the actual truth is irrelevant. I am far more interested in why this is happening, and along the way, I will discuss why fact checking and actual reality does not matter in this new world. In the end, I will also propose some solutions about how to return to a world where everyone agrees on at least the basic factual content of a situation. First, I would like to look at the idea of social cognitive dissonance. Cognitive dissonance is a condition where a person hold two completely contradictory ideas at the same time, and cannot see that there is an actual conflict between the views. An example of this is to be anti-abortion and pro-capital punishment, provided that the anti-abortion stance is based in the idea of all life being sacred. But this cognitive dissonance can also occur across a society. It happens when different factions believe things that are diametrically opposed to societal values. A perfect example of this is when people recite the Pledge with its line "one nation, indivisible at the opening of a Tea Party rally that drives a deep wedge into the fabric of American society. Anyway, the actual reality is that both men and women both have 12 pairs of ribs for a total number equaling 24. However, extremely devout Biblical Literalists tend to believe that men have one less rib than women, because of the story in Genesis. In fact, this segment of the population, when shown two skeletons, one of which is male and the other female, actually count different numbers on the two skeletons. These people literally cannot see that the number of ribs is identical. For all intents and purposes, reality for these people is actually different from the rest of society. I should note here, that even extremely devout medical students have the same factual blindness. The upshot of this is that for certain population groups, there is a subconscious blindness to things that to not fit into their expected reality. The subjects would never be able to see the world in the same manner; their biases profoundly altered their perceptions. 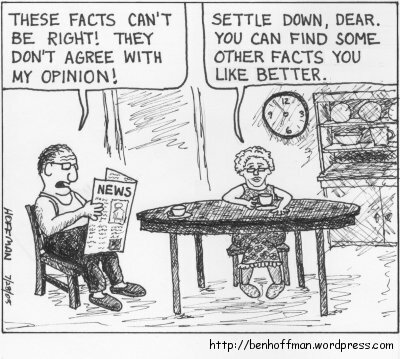 The same thing occurs with Political "Facts." People cannot accept things that do not fit into their perceptual biases. This goes a long way toward explaining the certainty of a Romney win among the Right and the anger at being wrong. Many on the Right were and are convinced that Romney was leading by a solid margin and was headed to a landslide. When he lost, they couldn't reconcile it with their perceptions, so the obvious conclusion has to be that President Obama won through nefarious means. Unlike the rib situation, the perceptual bias is not strong enough for them to actually believe that Mitt Romney won and will be inaugurated in January. It is a bias, not a psychosis; actual reality does intrude at some point, but not before Karl Rove had a meltdown on national TV. However in small cases, like the ribs, or in cases where the facts are disputable, unlike the pictures of President Obama giving his victory speech, the perceptual bias will reign. As in the rib case, no amount of proof will sway the believer, and sometimes it will even reinforce the belief. In some cases, the person giving the proof will be the one pitied for not knowing the "actual truth." But this social cognitive dissonance does not arise in a vacuum, and the cause of it is part of what drives the split in the country's perceptions. That cause is the highly partisan news media. If you had watched Fox News in the run-up to the election, you would have barely known anything about Hurricane Sandy's aftermath. That is because Fox was wall to wall talking about Benghazi, and talking about how it was a cover-up of Watergate proportions. If you watched CNN or MSNBC, you heard nothing about Benghazi, but massive amounts about Sandy. And on MSNBC, you heard about how this was the result of Global Warming. Different news channels, completely different facts. It is even worse on the internet, where on-line news sources like the Drudge Report, Red State, HuffPo and Think Progress present echo chamber reporting to reinforce a particular world view. There is no longer a need to step outside your comfort zone and hear points of view, or even actual news, that contradicts your belief system. There is not longer any need to hear about things that upset you; you can live in a perfect information bubble, and still think you are a well informed individual. And with this information bubble, you lack of challenging information gradually skews your world view. Your "facts" constrict and when there is any situation where there are two sides to the story, you automatically assume your side is right and the other wrong. And this mental iron curtain prevents you from accepting even the possibility of validity to the other side. But this bubble isn't the whole story either. In fact, our current media situation is very similar, at least in targeting, to what occurred in the years between the Revolution and the Civil war. At that time, every town had many newspapers, and those newspapers were extremely partisan, just like the current internet news sites and like today, people tended to only read things that they agreed with. So what else has changed to bring on this factual bifurcation? The other part of this is the hyper-partisan, us vs. them political environment. No longer is it enough to win, the opposition must be crushed, demoralized and humiliated. The opposition must be left bleeding in the gutter and the only way that can happen is if they are demonstrably the bad people out to destroy the country. And you have to have the "facts" to support that, otherwise it is just character assassination. But even further, as the "facts" become partisan, the independents matter less and less. Firing up the base becomes the primary task of the politician which pulls both sides closer to their fringes, and away from the middle. The middle only needs to be appealed to in the very last weeks running up to the election, and even then, the base is still very important. However, in fairness, I must note, the Republicans are far more influenced by their fringe elements than the Democrats are. The Democrats, in trying to pull in disaffected Republicans, tend to remain a bit more moderate on the whole. Still, both sides become more polarized as the middle becomes less significant. Without the need to appeal to moderates, and with the fear of being Primaried by the fringes, the average politician becomes beholden to the extreme partisans. In this process they have to craft a message that paints their opponent as evil. The distortion and division of "facts" aids in this process. Having your own set of facts reinforces why your side MUST win. Splitting the narrative in the country serves the Base political needs, and it is not in the interest of the Parties to have information out there that contradicts their message. Again, the Right is better at this than the Left. While MSNBC regularly criticizes the President and will occasionally call BS on the propaganda of the left , Fox rarely condemns and Right Wing Politician and actually functions as the propaganda wing of the Republican Party. Still, both sides do engage in this. So how to we combat this problem? How do we seize back the factual narrative in the country? One method is to bring back the Fairness Doctrine, which requires all media outlets to present both sides of an issue. On the surface, this seems like a good idea, and I would personally love to see Rush and Glen Beck have to present a liberal rebuttal to every one of their shows, However, this method is not the best, because sometimes one side is factually wrong and the other is factually correct. Having to present both sides as if they had actual merit and gravitas is really counterproductive to the process; sometimes you just need to call a lie a lie. The next thing we could do is demand our media rise to the standard that should be expected of the Fourth Estate. We could expect them to present the truth and nothing but the truth, call out a lie when one occurs and hold all politicians liable for the things they say. We could hang facts like the albatross around their necks. I fear that is a bridge too far. There is a lot of money to be made on partisan facts, and I doubt that the fringe panderers will willingly become responsible. Therefore it is up to you to find the truth. Find out both (or all) sides to a story, determine what is valid, talk to people you trust from both political parties and try to dig down to the truth. You may be exposed to a lot of information that upsets you, that is difficult to accept, and that shatters you complacent worldview. Being exposed to the other side does not mean that you will have to give up all of your beliefs, just the ones that are actually wrong. Being a part of a democracy is a lot of work, but being well informed of actual facts is one of the things we owe to our nation. And maybe through this, we can rebuild a nation that is actually indivisible.